With the humpback whale population in trouble on the Atlantic, there have been not one, not two, but three grim discoveries in the Mid-Atlantic region in the past week. Just two weeks ago, Bay Bulletin ran a story in which the National Oceanic and Atmospheric Administration (NOAA) implored Bay-region boaters to be cautious around humpback whales during peak migration season. Read it here. Since then, three humpbacks have been stranded on North Carolina and Virginia beaches. One was found in Corolla on the Outer Banks on Sunday. Also on Sunday, a stranded humpback was found on the beach at Back Bay National Wildlife Refuge in Virginia Beach. And one washed up near Oregon Inlet earlier in the week, after being spotted afloat off Jennette’s Pier in Nags Head. 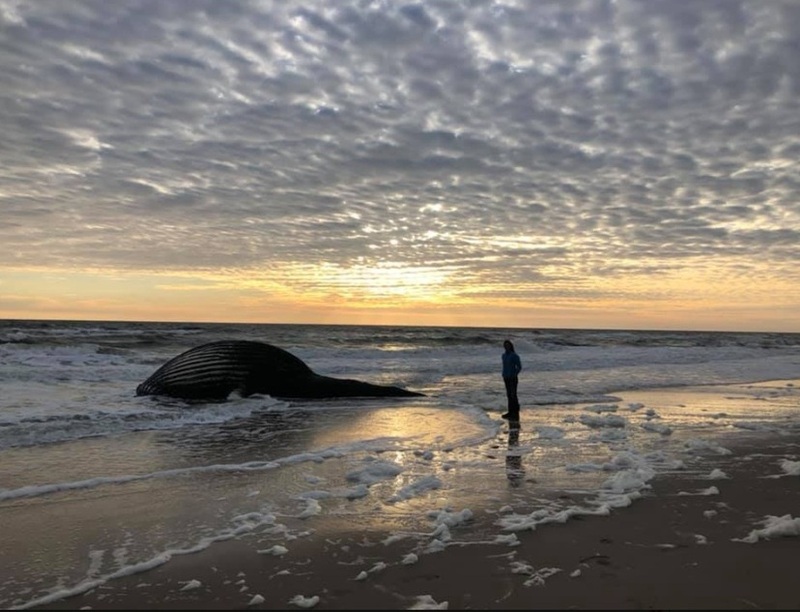 Further south, Corolla Beach Rescue has been asking the public to respect the space where a juvenile male humpback washed up. The beach rescue reported that a necropsy was planned. The three deaths come in the middle of an Unusual Mortality Event, or UME, as declared by NOAA Fisheries. A UME is defined as “a stranding that is unexpected; involves a significant die-off of any marine mammal population; and demands immediate response." Dozens of humpbacks have died along the Atlantic coast since 2016. Declaring a UME allows NOAA to investigate a string of marine mammal deaths, and gives them access to funds that support the investigation. Boat strikes are a growing concern as possible whale killers. But there’s no obvious evidence these three most recent humpbacks were slashed by a propeller. NOAA asks anyone who finds a beached or floating whale to let the experts know right away. The most important step members of the public can take to assist investigators is to immediately report any sightings of live whales in distress or stranded, or dead whales. Make the report by calling the Greater Atlantic Marine Mammal Stranding Hotline at 866-755-6622, the Southeast Marine Mammal Stranding Hotline at 877-433-8299 or contact the U.S. Coast Guard on VHF Channel 16. Do not approach or touch injured or dead marine mammals.